Oct. 3-9—CHESTER—Teams are now being formed for Spinzilla 2016, a week-long spinning marathon being held Oct. 3-9. Online sign up is open through Sept. 30 at spinzilla.org. The competition begins on Oct. 3 at 12:01 a.m. and ends Oct. 9 at 11:59 p.m. Organized by the Spinning and Weaving Group of The National Needlearts Association (TNNA), Spinzilla is a global event that coincides with National Spinning and Weaving Week. Due to the magic of the Internet, spinners everywhere can join a Spinzilla team, although rugged individualists can also opt to spin “rogue.” Last year, competitors spun 5,246,497 yards of yarn, while vying for the Golden Niddy-Noddy. In this spirit, Six Loose Ladies is offering a challenge to all spinners, whether or not they are participating in the official event. They have prepared a bright little mini batt of blended Romney wool and mohair. The challenge is to incorporate all of this fiber into a skein of yarn. Participants may add any other fibers or materials that they choose, and use any spinning techniques. The skein should be returned to the Chester shop no later than Saturday, Oct. 15. Prizes will be awarded for as many categories as they can contrive. Not a spinner? Call to arrange a tutorial and join in the fun. Six Loose Ladies yarn shop is located at 287 Main St., Chester. For more info, visit sixlooseladies.com, or call 802-875-7373. 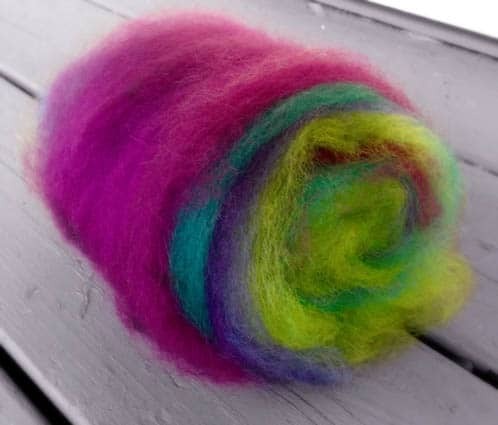 This brightly colored batt of Romney wool and mohair is part of a challenge to spinners, part of Spinzilla. How do I get the rolag of fleece? Should I come to the store? And how much is it? Can I mail you the finished yarn?